Much of the propaganda that inundates the world’s population is designed to justify animosities and conflicts, whether religious, racial or political. But there is a larger truth that also must be understood that we are all in this together, as Winslow Myers notes. For relief from such headache-inducing abstractions, I often walk a path that takes me along a tidal river to a midden, a cliff-high mound of oyster shells left from the summer gatherings of indigenous Americans over millennia. The midden slopes to a beach where horseshoe crabs forage along the sandy shallows,a species so resilient that it has sustained itself unchanged for 445 million years. Meanwhile, an “unnatural” factor, human consciousness, entered the scene. In what has been only an instant of evolutionary time, it became dominant,rather, it has assumed dominance over the system while in reality remaining totally subject to the system’s every law and principle. A Republican president and vice-president administer a torture program of global reach, a program that would subject them to potential criminal trial by Nuremburg standards, but they have enough support among both Republicans and Democrats,given our fear of the terrorist “other”,to receive a pass. Muslims, Christians, Alawites, Sunnis, Iranians, Jews, fans of Limbaugh, fans of Maddow, horseshoe crabs,we’re all in this together. Winslow Myers, author of Living Beyond War: A Citizen’s Guide, serves on the Board of Beyond War (www.beyondwar.org), a non-profit educational foundation whose mission is to explore, model and promote the means for humanity to live without war. My own opinion is roughly that the division of humanity into “haves” and “have-nots” sets up the dynamics that are destroying human existence on this planet. The “haves” will destroy human existence by war (vide the atom bomb)or poisoning(CO2, radiation, chemicals, garbage, pollution, control of resources, etc) rather than give up their power. The same can be seen at the Rio tragedy. The “have” states will not give up a little standard of living to remedy the damage it is doing to a planet occupied by all. At a national level this is expressed in the class system. It is expanding to embrace international affairs. So how do we get the rich to share the planet, their wealth, to provide a clean and healthy atmosphere for all? Theoretically, in a democracy the “have-nots” are in the majority, and should be able to dispossess the few “haves”. But of course the “haves” use their wealth to indoctrinate the “have-nots’ to abandon their collective self-interest and substitute for it the instilled values of the “haves”. It’s as simple , but as difficult as that. So class-war, or at least class-consciousness, is sadly still the answer. So what. Are the Bilderbergers Zionists too? As for the rest of your comment, I have been a fervent anti-Zionist for quite some time as a perusal of my blog will reveal. Unlike what you post, it isn’t rife with Anti-Semitism. Thanks Al. You express it very clearly. I have been observing this rabid tone in Rehmat’s writing since I started visiting ConsortiumNews. His anti-antisemitism is very obvious it screams, and has often deterred me from quoting him. Someone who hates so effortlessly and irrationally has nothing to offer a debate about facts. Your exchange above exposed him as being very childish. What is important is the starting point. Mine is humanism and the Universal Declaration, with all it’s flaws. Secondly I accept no assertion without corroborating evidence. Lastly, I am very careful not to use collective pejorative labels, especially references to race or religion. I just wish he would go somewhere and think it all through. Piling up pejorative labels in front of a name argues fanaticism, not careful analysis. I’m sure he will come back at me with his fists swinging. I have never seen him argue calmly and rationally. What has “global 2000 written by Rockefeller contractors Henry Kissinger, Z. Brzezinski, Gen. Alexander Haig, and Ed Muskie for President Carter” to do with Zionism? The answer is nothing. Is Kissinger a “Zionist?” No, Kissinger is a fascist imperialist power player. Was his involvement in the Chilean coup a “Zionist plot” as well? Let me be clear. I am an anti-Zionist but we need to separate anti-Zionism from anti-Semitism which continues to push the old canard of Jewish cabals running the world with secret destructive agendas. There seems to be a resurgence of this and it needs to be called out. Those who rightly object to Zionism object to all examples of right-wing nationalism because they abuse human rights and lead to fascism. Kissinger et all must be condemned for their crimes against humanity but it should be clear that they serve U.S. imperial interests (as does Israel which is our puppet state) and that their crimes are those of international imperialism and the behest and for the benefit of the capitalist elite — most of whom are not Jews or “Zionists” unless it serves their momentary interest. Well put. To refer to Kissinger as a “Zionist” is one thing, though it overlooks his fascist overtones. But to refer to him as a “Zionist Jew” is the antisemitic dead-giveaway. I don’t like Kissinger either, but there is ample to criticize without ever mentioning his ancestral heritage. Apparently Rehmat is an anti-Semite as almost every entry on his blog is like that. Sad because that feeds into the Zionist accusation of critics as anti-Semitism at a time when mainstream Jews are moving waking up to the reality of Israeli apartheid and moving away from Zionism. Unless we face the evidence without prejudice we will continue to adapt ourselves into extinction. as evidence of the best survival expression. of another life form that feeds on the parasite. Abraham Lincoln famously said, â€œa house divided cannot standâ€ yet here we are, a nation more divided than at any time in our post Civil War history â€“ in may ways maybe even more so. I have to wonder, beyond superficial talking points what is at the root of this. After all, don’t most of us want the same things: security, freedom, opportunity, a better future for our children? Partly, the divide results from the cubbyholeization of culture, literature and the media as we are ever more divided into markets. The America I grew up in had three national TV channels and only AM radio. The news may have been inaccurate but we all heard the same things. We were all exposed to the same range of culture and though we certainly didn’t all agree, we were at least operating from the same base of information. This was also true of standard education. That culture may have been limited in range to white men, but we were all exposed to it. Today, while more information is available, we all hear what we want to, or at least, the variety of spin especially designed to fit our world view. We read people like ourselves and re-enforce our subcultural and political identities, often ignoring the experience of others. Thus our tribal or subcultural identities, loyalties, and division are strengthened at the expense of our social cohesiveness. Another aspect, I believe, is fostered at great expense by those whose interests benefit by it in the accrual and maintenance of power. Especially useful here are emotion laden wedge issues and the conflation of politics with sports. Humans are group animals. We develop strong bonds of loyalty to and identification with things larger than ourselves, like nations, family, tribe, teams, and cultures. As an ancient Chinese sage once said, â€œOne passion lurking in the heart has the power to obscure all reason.â€ And so it is with our chosen loyalties. Jonathan Haidt, a professor of psychology at New York University’s Stern School of Business recently wrote in a article, Why Working-class People Vote Conservative, â€œpolitics at the national level is more like religion than it is like shopping. It’s more about a moral vision that unifies a nation and calls it to greatness than it is about self-interest or specific policies.â€ He postulates that the Republicans do a better job of presenting a moral vision â€“ even if the reality of their policies more often than not violate cultural values we all share, undermining our personal security and opportunity. I disagree. Democrats certainly promote values as well though they are less ideologically cohesive. It is the emphasis of those moral visions and cultural perspective which differ. Culture is a powerful force. It defines how we interpret the world around us; how we see ourselves. It defines how we see others, how we relate to each other and to the development of our loyalties. The corporate influence on our culture cannot be understated. It has been shaped consciously in recent decades by movies, video games, TV and music to emphasize an antisocial individuality along with ideals of material accumulation, vengeance and militarism. We Americans have become increasingly a nation of individuals valuing our personal liberty above all else. We hate rules. We want to find ourselves and be different even when much of the time that plays out as uniform sub-cultural identification. Thus the appeal of â€œLibertarianismâ€ both right and left. I certainly share some of those values being an independent thinker and an individualist not adhering to popular fashions. I enjoy thinking for myself and I despise dogmas and fads. The reality is that we are all mutually dependent for our very existence. The real history of our country, much less of our species, is one of community. The rugged individualism of the old west is a myth and â€œDirty Harryâ€ can easily become Anders Behring Breivik or Jared Lee Loughner. The so-called â€œculture warâ€ is at the root of what keeps us shouting at each other instead of listening and working together for our mutual benefit. At its root are two visions. One emphasizes community and social cooperation for the common good even while cherishing individuality. The other holds the primacy of individuality even at the expense of the common good â€“ seen as somehow threatening to the former, ie â€œthe nanny state.â€ In the modern world, especially given recent history, there are reasons to fear an all-powerful state. This is shared by people across the political spectrum. The nature of â€œthe Stateâ€ itself is even seen differently. Socialists and Anarchists have historically defined the State as a tool for the oppression of the majority by an elite. The former see the necessity for a new kind of State as the method of popular democratic participation in distribution of necessities and for ensuring the common good. This vision, in challenging the system of crony Capitalism as a form of feudalism, threatens the interests of the elite and is thus demonized. Anarchists, naively, want to do away with all government. Libertarianism is a form of Anarchism which rails against â€œthe stateâ€ pitting individuality against â€œcollectivism.â€ Though Libertarians exist on both the right and the left, our corporate ruling class have latched onto and promoted right Libertarianism blended with a cultish Ayn Rand influence. This toxic anti-social corporate anarchy speaks to many because it plays into the essence of our national individualist tendencies while supporting a corporate agenda cloaked in populism. Via their â€œTea Partyâ€ they have succeed in taking over the GOP and have a good chance of tapping into general malaise in the next election. Since Freud came on the scene in the early 20th century, psychology has been used by the powerful and those seeking power to influence us. The manipulation of culture is nothing new and the struggle of the social versus the anti-social has been at the core. The anti-social agenda is usually sold as a defense of culture against attack whether it is the â€œBlood and Soilâ€ of the Nazis, the fight against infidels of the Islamists, the â€œNever Againâ€ of radical Zionists or the â€œdefense of Christian values and the American way of lifeâ€ by our own right. In our own county the schism is exaggerated via psychological manipulation at great expense. The Supreme Court ruling in the â€œCitizens Unitedâ€ case poured gasoline on that fire. As the Virginian Pilot reported on June 4th our state, as a swing state, is seen as a â€œhot marketâ€ for campaign ads. Prepare to be inundated. Billions will be squandered by secretive super-pacs spreading fear and smear to widen the divide between us in hopes of selling the candidates of their choice, and not without effect. As we saw in Wisconsin where an unpopular governor who gutted the states labor laws, fired public workers and threatened the living standards of many defeated a recall attempt by spending $30.5 million supplied in large part by corporate backers and right-wing pacs. The opposition, including Labor, could only muster $4 million. Governor Walker got 53% of the vote by spending 88% of the money. Even many of those opposing his policies voted for him. The moral of the tale is that money buys power and that applied psychology is effective in manipulating public opinion. This does not bode well for us as a nation. Unless we can alter the way political campaigns are run and funded, the wealthiest will continue to pit us against each other to sweep from office anyone they see as challenging their interests. Fortunately, political systems and elections are not an immutable force of nature. They are devised by people with rules subject to change. There are efforts underway to counter the â€œCitizens Unitedâ€ ruling by amending the Constitution. S.J Res.33 submitted by Senator Bernie Sanders of Vermont would â€œexpressly exclude for-profit corporations from the rights given to natural persons by the Constitution of the United States, prohibit corporate spending in all elections, and affirm the authority of Congress and the States to regulate corporations and to regulate and set limits on all election contributions and expenditures.â€ There is much popular support for this across the political spectrum but it is not enough. We need publicly funded elections with guarantees of equal exposure to all qualifying candidates regardless of party affiliation. Elections need to be about ideas, not personalities. We also need to do away with the archaic and corrupt Electoral College. Maybe we need to learn from other democracies and move to a more pluralistic, multiparty system based on proportional representation which is less stable but provides better citizen representation. Getting the money influence out of the electoral process would go a long way in reducing the inflaming of our divisions but it would not end it. More importantly, we need to turn off the partisan hacks and actually listen to each other. I have learned from some of my conservative friends and I believe they have learned from me. Politics is not sports and neither official â€œteamâ€ includes us. As I wrote earlier, I believe we have much more in common than anything that separates us and nothing more important than the future we all must share. The Democratic Republic envisioned by our founders requires the participation of an informed citizenry. That vision has been usurped by a corporate oligarchy which continues to divide us against each other to maintain their power over us. If we are to save ourselves as a nation we need to step back from the chasm of partisanship, reform the process, examine issues rationally and work together for our mutual benefit. What evolves in all other life forms on the planet is DNA. What evolves in human populations is ‘culture’. Humans run on software, whereas all other apex predators run on teeth and claws. Culture is the ‘software’. Microsoft has various editions of ‘Windows’. We have software called Christian, Muslim, Hebrew, etc. and, all of them are flawed. They change over time, adapt somewhat, but it is often hit or miss. Sometimes, they change dramatically, and we get a Jonestown cult or a Hale-Bopp cult. Sometimes we get a gold plates and magic underwear cult. Sometimes, they incorporate primitive galvanic technology, and we get a lie-detector cult that believes in ‘Thetans’ from another planet. They are almost all willing to accept each others’ technology, but not each other’s ideas. Even the Amish wear clothes, use fire and occasionally drive cars, despite their putative disdain for technology. Symbolism permits the transfer of technology without excess cultural baggage. But check out what happens when you give steel knives to indigenous populations who have only known stone tools. Cultural evolution is much more significant to human existence than biological evolution. DNA provides a range of variation from which some characteristics confer advantage. In humans, the most significant one is the ability to manipulate symbols. It allows us to run on software, flawed or not. The flaw in the software is the ability or lack thereof to distinguish whether or not the symbolism represents something that actually exists. The sentence, â€œA squared plus B squared equals C squaredâ€ can be demonstrated to accurately reflect the mathematical reality of a right triangle. That â€œGodâ€ created anything in particular cannot be demonstrated to reflect anything but a collection of words that convey an idea of dubious origin. There are people who intuitively understand this human software flaw. For the most part, they keep it to themselves. They have provided humanity with most of the concepts which have advanced our species. They are people like Thomas Edison, Albert Einstein, Steve Wozniak, Mark Twain, Ernest Hemingway, Niels Bohr, Gregor Mendel, Mikhail Gorbachev, and Pablo Picasso. On the other hand, there are people like Billy Graham, Jerry Falwell, Pat Robertson and the Pope, none of whom have advanced humanity one iota. The former are called atheists, and the latter are regarded as devout. Strangely enough, Charles Darwin was not an atheist, and neither was Adolf Hitler. Talk to an atheist, and you may hear the same thing I have heard many times: â€œLife would be easier if I could believe, but I just can’tâ€. Here’s the pearl, folks, and you heard it here first: there’s a code for it in our DNA. Probably about 10% of the population have the gene sequence that patterns them to see through the symbolic flaws in superstitious belief. 50% of the United States population does not believe in evolution, according to recent polls. Be afraid. Be very afraid. Now that the human genome is out there, somebody will try to identify the code. As one philosopher put it, â€œTheism is simply untenableâ€. As a good friend of mine, an expert in psy-ops put it, â€œPropaganda is easy. Show me a believer, and I’ll show you somebody that will believe anything.â€ As we reach the limits of Earth’s ability to sustain the ultimate apex predator, the believers and the rational thinkers will be pitted against one another. The numbers don’t look promising for the rational thinkers. But the horseshoe crabs will do just fine. in order to sustain a pseudo Democracy is a masterful sham political criminality ! Very few Christians, atheists, fools, investors cared less than making a fast buck except the parents who lost loved ones. But for us, it’s different. Look again at that dot. That’s here. That’s home. That’s us. On it everyone you love, everyone you know, everyone you ever heard of, every human being who ever was, lived out their lives. The aggregate of our joy and suffering, thousands of confident religions, ideologies, and economic doctrines, every hunter and forager, every hero and coward, every creator and destroyer of civilization, every king and peasant, every young couple in love, every mother and father, hopeful child, inventor and explorer, every teacher of morals, every corrupt politician, every “superstar,” every “supreme leader,” every saint and sinner in the history of our species lived there â€“ on a mote of dust suspended in a sunbeam. The earth is a very small stage in a vast cosmic arena. Think of the rivers of blood spilled by all those generals and emperors so that in glory and in triumph they could become the momentary masters of a fraction of a dot. Think of the endless cruelties visited by the inhabitants of one corner of the dot on scarcely distinguishable inhabitants of some other corner of the dot. How frequent their misunderstandings, how eager they are to kill one another, how fervent their hatreds. Our posturings, our imagined self-importance, the delusion that we have some privileged position in the universe, are challenged by this point of pale light. Our planet is a lonely speck in the great enveloping cosmic dark. 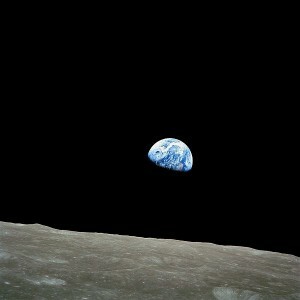 In our obscurity â€“ in all this vastness â€“ there is no hint that help will come from elsewhere to save us from ourselves. It is up to us. It’s been said that astronomy is a humbling, and I might add, a character-building experience. To my mind, there is perhaps no better demonstration of the folly of human conceits than this distant image of our tiny world. To me, it underscores our responsibility to deal more kindly and compassionately with one another and to preserve and cherish that pale blue dot, the only home we’ve ever known.